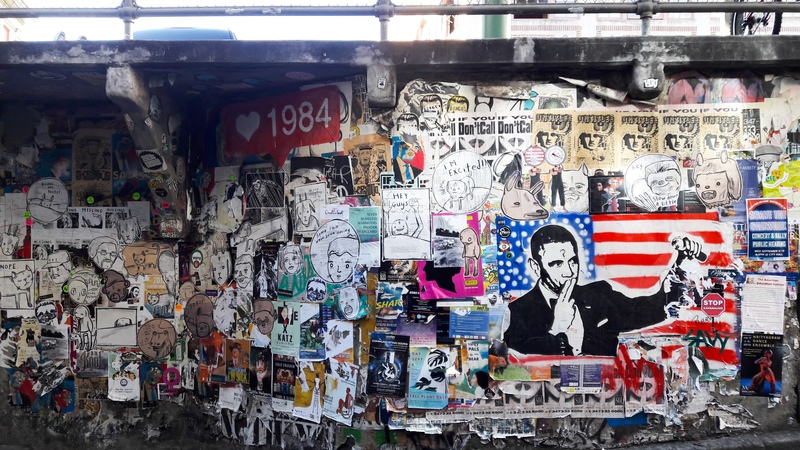 Between two giant tourist attractions in Seattle, being the Gum Wall and the Pike Place Market is my favorite thing in the area for all visitors to check out…the art on the wall of Post Alley. You’ll find this in the side of a downwards driveway below the big sign to the left, towards the Gum Wall from the west end of Pike Street. It’s hard to miss, unless really tired. But, I love it any time as it is always changing. It’s full of social messages, with some politics. Also full of adverts, shameless self-promotion, heads up on local events, and some puzzling stuff. That’s all for today. I think the imagery has at least a thousand more words that speak to the reader than I can put forth for now. Just click on to enlarge and explore! The above shot is from the Madison and 4th Building in downtown Seattle, where I currently work these days. It’s from yesterday, being the last sunny day of summer, but with wind and cold outside ushering in the new Fall Season. In the distance are two of Seattle’s tallest buildings. To the right, being the 76-floor Columbia Tower, a familiar tower to those who lived here over the last few decades. On the left to the middle is the more recent 44-floor F5 Tower, completed in 2017. Some cool facts: its glass walls are designed to handle temperature and energy use by letting in some sun rays and reflecting others. It uses the same glass as the One World Trade Center in New York City. It also holds rainwater for reuse, has a 35-foot-tall”living wall” where plants grow and have solar energy equipment upon its roof. But rising up high in another building and seeing a different angle of the F5, there is a barely seen symmetry to it, that is brilliant and awesome (see top picture). Maybe someday, I will go inside and see more for myself. Hopefully, up high and getting the chance to look around, and gain new perspectives. I did nothing worth writing about for this passing weekend. But the last weekend before through Labor Day, I did heavily geek out to my side passion for a big event of digital interactive entertainment, or video games as normals will call it. Here in the Pacific Northwest, we have this annual PAX West convention, a big gathering for video game entertainment and tabletop gaming enthusiasts. Fans, publishers, developers, merchants…all mingle, promote, share, discover, collect, and most importantly to play. All held at and around the Washington State Convention Center in downtown Seattle. It was all good fun, which is the least I ask for in a successful PAX West. For me, it’s mostly the discovery and exploration of what’s fresh and exciting for my gaming desires. Here at the PAX West, the indie game scene is growing with new developers, presenting fresh spins on traditional platforming styles, shoot-em-ups, complex thinking and problem-solving. Other upcoming games I anticipated above others at PAX West: My Friend Pedro, Megaman 11, The Messanger, Praey for the Gods, Indivisible. All of which, are not games that require much of my time, with beautiful visuals, concepts, storytelling pull…yet using gameplay mechanics from the classics (mostly platforming), and mixing them with new tech and innovation. Here are some colorful LED backed moments from PAX West. All part of a loud, colorful jungle of new tech and consumer splendor. And that’s all for here. But, I did write a bit more on it for another site, strangerworlds.com. Click here to read my full report.